Naive Th cells can be directed in vitro to develop into Th1 or Th2 cells by IL-12 or IL-4, respectively. In vivo, chronic immune reactions lead to polarized Th cytokine patterns. We found earlier that Borrelia burgdorferi, the spirochaete that causes Lyme disease, induces Th1 development in αβ TCR-transgenic Th cells. Here, we used TCR-transgenic Th cells and oligonucleotide arrays to analyze the differences between Th1 cells induced by IL-12 vs those induced by B. burgdorferi. Transgenic Th cells primed with peptide in the presence of B. burgdorferi expressed several mRNAs, including the mRNA encoding IL-17, at significantly higher levels than Th cells primed with peptide and IL-12. Cytometric single-cell analysis of Th cell cytokine production revealed that IL-17 cannot be categorized as either Th1 or Th2 cytokine. Instead, almost all IL-17-producing Th cells simultaneously produced TNF-α and most IL-17+ Th cells also produced GM-CSF. This pattern was also observed in humans. Th cells from synovial fluid of patients with Lyme arthritis coexpressed IL-17 and TNF-α upon polyclonal stimulation. The induction of IL-17 production in Th cells is not restricted to B. burgdorferi. Priming of TCR-transgenic Th cells in the presence of mycobacterial lysates also induced IL-17/TNF-α coproduction. The physiological stimulus for IL-17 production was hitherto unknown. We show here for the first time that microbial stimuli induce the expression of IL-17 together with TNF-α in both murine and human T cells. Chronic IL-17 expression induced by microbes could be an important mediator of infection-induced immunopathology. Cytokines produced by Th lymphocytes are critical for the regulation of both protective and pathogenic immune responses. An operational definition by which Th1 cells produce mostly IFN-γ, IL-2, and TNF-β, whereas Th2 cells produce mainly IL-4 and IL-5 (1), has proven to be useful for the understanding of immune reactions in infectious, autoimmune, and allergic diseases, although probably an oversimplification (2). Th cells that produce cytokine patterns distinct from the canonical Th1 or Th2 subsets have been described and named Th0 (3), Th3 (4), or Tr1 (5), respectively. In vitro, Th1 cells are induced by priming with Ag in the presence of IL-12 (6, 7), whereas IL-4 induces the differentiation into Th2 cells (8). The signaling pathways and transcription factors critical for Th1/Th2 differentiation are currently being elucidated (9, 10, 11). The pattern of cytokine coexpression of cells from Th cell lines generated in vitro is highly polarized and stable following a few cycles of Ag stimulation and rest under the appropriate culture conditions (12, 13). Following chronic antigenic stimulation, e.g., in persistent infections or allergy, polarized cytokine patterns can also be observed in vivo (14, 15). The irreversibility of Th phenotype differentiation observed in vitro is at least partly due to the down-regulation of IL-4 signaling in Th1 cells (11, 16) and the down-regulation of IL-12 signaling in Th2 cells (11, 17). However, Th2 cells maintain their IL-12 responsiveness if IFN-γ is present (11, 18, 19, 20), and several lines of evidence suggest that this is usually the case in vivo. For example, coexpression of IFN-γ and IL-4 was found in clonal T cell populations following immunization of mice with protein Ag (21). More recently, we analyzed cytokine production in Th cells isolated from pulmonary granulomas induced by Schistosoma mansoni eggs, by single cell flow cytometric analysis, and found random coexpression of IFN-γ and IL-4 in individual Th cells (22). Furthermore, both IL-4 and IL-5 were frequently coproduced with IL-2 in Th cells obtained from these granulomas, a pattern that is not usually observed in Th2 cells in vitro (22). Thus, Th phenotype differentiation seems to be more flexible in vivo than in vitro (23). IL-12 is a dominant factor for Th1-induction both in vitro (6, 7) and in vivo (24). Several microorganisms, including Borrelia burgdorferi, can induce IL-12 expression in macrophages (7, 25, 26, 27, 28). We had found earlier that αβ TCR-transgenic T cells specific for an OVA-peptide bound to I-Ad develop a Th1 phenotype when they are primed in vitro in the presence of B. burgdorferi or small synthetic lipopeptides corresponding to the N-terminal sequences of B. burgdorferi outer surface lipoproteins. This effect could be blocked only partially by anti-IL-12 (28). B. burgdorferi induces not only IL-12 but also other cytokines in host macrophages, including IL-1β (29), TNF-α, IL-6 (30), and IL-10 (31). Whereas IL-1β and TNF-α can support Th1 phenotype development (27, 32, 33), IL-6 and IL-10 would be considered antagonistic to Th1 induction (34, 35). Therefore, the increased IFN-γ production and decreased IL-4 production induced by B. burgdorferi is the net effect of diverse signals, some of which antagonize each other. This complicated situation, rather than Th priming in the presence of selected polarizing cytokines in vitro, is likely to be typical of differentiation in vivo induced by microbial pathogens. Here, we compare the difference between IL-12- and B. burgdorferi-induced differentiation of Th lymphocytes with respect to cytokine expression. To be able to follow the fate of a defined population of naive Th lymphocytes during their differentiation, we primed TCR-transgenic T cells either with APC and Ag alone or in the presence of IL-12 or B. burgdorferi lysates, respectively. Using array technology, the expression of 250 different mRNAs was monitored in the differentially treated T cell populations. Among other differentially expressed genes, IL-17 was preferentially expressed in Th cells primed in the presence of B. burgdorferi. IL-17 is a recently discovered cytokine (36, 37) that has been associated with chronic inflammatory conditions, such as rheumatoid arthritis (38, 39) and multiple sclerosis (40). Much less is known about murine IL-17, and the natural stimuli for the production of either human or murine IL-17 are unknown. Therefore, we chose expression of IL-17 by Th cells for further analysis. Using multiparameter flow cytometry, we show here that B. burgdorferi, M. tuberculosis, and synthetic lipopeptides derived form B. burgdorferi outer surface lipoproteins induce IL-17 expression in both murine and human Th cells. The IL-17-producing Th population is different from “classical” Th1 or Th2 cells. It is characterized by the coexpression of the proinflammatory cytokines IL-17, TNF-α, and GM-CSF. Thus, IL-17, which has been found in inflammatory lesions (38, 39, 40), is induced by microbial stimuli and coexpressed with other proinflammatory cytokines. The failure to down-regulate microbe-induced expression of IL-17 could therefore be one link between infection and autoimmunity. Mice expressing the transgene for the DO11.10 TCR (41) were provided by Dr. D. Loh (Washington University, St. Louis, MO). This TCR recognizes residues 323–339 of OVA in association with I-Ad. Transgenic mice were maintained on the BALB/c background in our animal facility. Mice were housed under pathogen-free conditions. All procedures were performed in accordance with institutional and state guidelines. Low-passage N40 strain B. burgdorferi sensu stricto were propagated in BSK medium (Sigma, St. Louis, MO) with 6% rabbit serum (Sigma), and sonicates were made as described before (42). The sonicate of 106 B. burgdorferi yields ∼3 μg protein. B. burgdorferi sonicate (Bb) was used at 10 μg/ml final concentration. The synthetic lipopeptide A (LpA)3 derived from the published sequence of B. burgdorferi strain ZS7 (GenBank accession no. X16467) was made by solid phase synthesis as described (28) and purchased from the Department of Biochemistry of the Charité Hospital (Berlin, Germany). LpA was used at 10 μM final concentration. M. bovis bacillus Calmette-Guérin (BCG) strain Danish were grown to log phase (108/ml) in Middlebrook medium, washed twice in PBS, and a total lysate was prepared by sonication as described before (43). The OVA323–339 peptide was obtained from Dr. Achim Kramer (Institut für Klinische Immunologie, Charité Hospital, Berlin, Germany). The peptide was synthesized according to standard Fmoc machine protocols using a multiple peptide synthesizer (Abimed, Langenfeld, Germany). Purity was determined by HPLC and composition monitored by matrix-assisted laser desorption ionization time-of-flight mass spectroscopy. Recombinant murine IL-2 (Eurocetus, Amsterdam, The Netherlands) was used at 100 U/ml final concentration. Recombinant murine IL-4 (Biosource International, Camarillo, CA) was used at 200 U/ml final concentration. Anti-IL-4 Abs (11B11) were purified from hybridoma supernatants at the Deutsches Rheumaforschungszentrum (Berlin, Germany) and used at 5 μg/ml final concentration. Recombinant murine IL-12 and mAb against murine IL-12 were from Genetics Institute (Cambridge, MA) and used at 10 ng/ml and 400 ng/ml final concentration, respectively. Polyclonal goat IgG was purchased from Dianova (Hamburg, Germany). All cultures and assays were done in RPMI supplemented with serum and antibiotics at 37°C in 5% CO2 as described (42). Single-cell suspensions were prepared from spleens by pressing the spleens through a fine wire mesh. Mononuclear cells were isolated from suspended splenocytes by density gradient centrifugation. A total of 4 × 106 lymphocytes were cultured at 2 × 106 cells/ml with 0.3 μM OVA under neutral conditions (OVA alone) or under Th1 (IL-12 plus anti-IL-4) or Th2 (IL-4 plus anti-IL-12) polarizing conditions. In some experiments cytokines, B. burgdorferi, M. bovis BCG strain Danish sonicates, or synthetic lipopeptides were added to the primary culture. On day 3, the T cells were expanded by adding new medium and 100 U/ml IL-2, and, on day 7, the cells were harvested, washed twice, counted, and restimulated as described below. CD4+ cells were isolated by high-gradient magnetic cell separation (MACS; Miltenyi Biotec, Bergisch-Gladbach, Germany). CD4+ cells were incubated with CD4 mAb coupled to magnetic beads (Miltenyi Biotec) according to the manufacturer’s instructions and sorted using VS+ MACS columns and the MidiMACS system (Miltenyi Biotec). Aliquots of the unsorted and the CD4-selected cell fractions were stained with CD4-PE and analyzed by flow cytometry. The CD4+ population was sorted to a purity of >98%. Mononuclear cells were isolated from suspended splenocytes as described above and cultured at 2 × 106 cells/ml with 0.3 μM OVA. Where indicated, IL-12 or B. burgdorferi sonicate were added to cultures at a concentration of 10 ng/ml and 10 μg/ml, respectively. On day 3, the T cells were expanded by adding new medium and 100 U/ml IL-2, and, on day 7, the cells were harvested, washed twice, counted, and restimulated. For restimulation, T cells were cultured with 0.3 μM OVA peptide presented by T cell-depleted syngenic splenocytes at a 1:1 ratio; 2, 6, and 20 h after restimulation, cells were harvested, washed, and resuspended to proceed to CD4+ magnetic separation. T cells were also restimulated in the absence of the specific Ag OVA; RNA isolated from those T cells was used to define the baseline gene expression. A fraction of the restimulated culture was maintained for two more days, to provide supernatants for the analysis of IL-4 and IFN-γ by sandwich ELISA. Another fraction of the cells was stimulated PMA/ionomycin and analyzed flow-cytometrically for intracellular IFN-γ and IL-4 Abs. Total RNA was isolated from frozen samples using RNeasy Midi Kit (Qiagen, Chatsworth, CA), according to the manufacturer’s instructions. Before processing frozen lysates, samples were thawed and incubated for 15 min at 37°C in a thermo block to dissolve salt. The concentration and purity of RNA were determined by measuring the absorbance at 260 nm (A260) and 280 nm (A280) in a spectrophotometer. Absorbance readings at A260 measure RNA concentration and should be greater than 0.15 to ensure significance. The ratio between A260 and A280 gave an estimate RNA purity. Ratios determined for the RNA used in this work were always 1.9–2.0 (pure RNA has a ratio of 1.8–2.0). RNA was quantitatively amplified and biotin-labeled according to Byrne et al. (44). Briefly, RNA was converted to double-stranded cDNA using an oligo(dT) primer that has a T7 RNA polymerase site on the 5′ end (5′-GGCCAGTGAATTGTAATACGACTCACTATAGGGAGGCGG-(T24)-3′). The cDNA was then used directly in an in vitro transcription reaction in the presence of biotinylated nucleotides Bio-11-UTP and Bio-11-CTP (Enzo, Farmingdale, NY). To improve hybridization kinetics, the labeled antisense RNA was fragmented by incubating at 94°C for 35 min in 30 mM MgOAc, 100 mM KOAc. Hybridization to a custom Genechip (Affymetrix, San Jose, CA) displaying probes for 250 genes of immunological interest was performed at 40°C overnight in a mix that included 10 μg fragmented RNA, 6× SSPE, 0.005% Triton X-100, and 100 μg/ml herring sperm DNA in a total volume of 200 μl. Chips were washed, stained with PE-streptavidin, and read using an Affymetrix Genechip scanner and accompanying gene expression software. Labeled bacterial RNAs of known concentration were spiked into each chip hybridization mix to generate an internal standard curve, allowing normalization between chips and conversion of raw hybridization intensity values to mRNA frequency (mRNA molecules per million). Cells (106/ml) were stimulated with 5 ng/ml PMA and 1 μg/ml ionomycin (Sigma) for 5 h. At 2 h, brefeldin A (Sigma) was added at 5 μg/ml. Before fixation, cells were washed, incubated with blocking anti-Fcγ-R mab and rat IgG to prevent unspecific Ab binding, and stained with the appropriate Abs specific for surface molecules (CD4, GK1.5; CD8, 53.6.7; or clonotype, KJ1.26; Ref. 45). Cells were washed and fixed with 2% formaldehyde for 20 min as described (46). Cells were washed and then permeabilized with saponin (0.5%; Sigma) for intracellular staining simultaneously with three anti-cytokine mAbs conjugated to FITC, PE, or digoxigenin (Dig). Before staining, unspecific binding was prevented by incubating cells with blocking reagent as described above. The following mAbs were used: FITC-coupled anti-IFN-γ (XMG1.2) (PharMingen) at 2.5 μg/ml; PE-coupled anti-IL-4 (11B11), anti-GM-CSF (MP1-229), anti-IL-2 (S4B6) at 2 μg/ml, and anti-TNF-α (MP6-XT22) at 0.5 μg/ml (PharMingen); digoxigenized anti-IL-2 (S4B6), anti-IL-4 (11B11), and anti-IL-17 (TC11-18H10) were prepared in our laboratory, used at 1 μg/ml, and subsequently detected with anti-Dig conjugated to Cy5. Anti-Dig-Cy5, FITC-, or PE-labeled isotype control mAbs (PharMingen) were used at the same concentrations as the respective anti-cytokine mAbs. After intracellular staining, cells were washed with PBS/BSA and stained with streptavidin coupled to peridinin chlorophyll protein (1 μg/ml; Becton Dickinson, Mountain View, CA) to identify CD4+ cells. Samples were analyzed by four-color flow cytometry on a FACScalibur, and ∼20,000 cells were acquired for each sample. For cytokine determination, 1 × 106 T cells were restimulated in 2-ml cultures with 0.3 μM OVA presented by 2 × 106 irradiated (30 Gray) syngenic splenocytes. Supernatants were collected at 48 h for analysis by sandwich ELISA for IL-17 according to the manufacturer’s instructions (PharMingen). The lower detection limit for IL-17 was 15 pg/ml. Seven patients met established clinical and serological criteria for the diagnosis of Lyme arthritis. Their clinical characteristics have been described before (47). One patient suffered from Chlamydia-associated acute reactive arthritis. Patients were seen at the Charité or Benjamin Franklin University hospitals. Aspiration of synovial fluid was performed by biopsy of the knee joints for diagnostic or therapeutic reasons. Approval for biopsies was provided by the respective hospital’s Ethical Committee, and informed consent was obtained from the patients. Blood was drawn from four healthy donors after informed consent was obtained. Synovial fluid mononuclear cells (SFMC) or PBMC were prepared as previously described (42). Flow cytometry of human cells was performed as described above for murine cells with the following modifications: human SFMC or PBMC (2 × 106/ml) were stimulated with PMA (5 ng/ml) and ionomycin (1 μg/ml; Sigma) for 5 h. At 2 h, brefeldin A (Sigma) was added at 5 μg/ml. After incubation, cells were fixed with 2% formaldehyde as described above. Because CD4 is down-regulated upon PMA/ionomicyn stimulation, we defined the T cell population producing IL-17 by staining with anti-CD3 and anti-CD8 Abs, and, intracellularly, with anti-IL-17. In preliminary experiments, we identified CD3+/CD8− cells as IL-17 producers; therefore, in additional experiments, we used only anti-CD3 Abs for staining Th cells (CD3+/CD8−). For this reason, the small CD4−/CD8−/CD3+ population could not be considered in our analysis. Fixed cells were stained with FITC-labeled anti-CD3 (OKT3) Abs. After surface staining, cells were washed and then permeabilized with saponin (0.5%; Sigma) for intracellular staining simultaneously with anti-IL-17 (R&D Systems, Minneapolis, MN) coupled to Dig- and FITC-labeled anti-TNF-α (Hölzel, Köln, Germany) or anti-IFN-γ (4SB3). Thereafter, cells were washed twice and incubated with Cy5-labeled anti-Dig Abs. After that, cells were washed again and resuspended in PBS/BSA. Student’s t test was used to compare the mean difference between related cultures. Differences between means were considered significant if the two-tailed p value was less than 0.05. We employed oligonucleotide arrays to extend our initial observation that the presence of B. burgdorferi skews T cells to a Th1 phenotype (28), and to distinguish that phenotype from the Th1 phenotype resulting from exposure to IL-12. DO11.10 TCR-transgenic T cells were primed with OVA alone, OVA plus IL-12, or OVA plus B. burgdorferi sonicate (Bb). After 7 days, each culture was restimulated for 2, 6, or 20 h with OVA, and CD4+ T cells were immediately isolated by MACS and their RNA isolated. At each time point, RNA was also isolated from control samples that were not restimulated with OVA. The RNAs were analyzed on DNA chips that monitor the expression of ∼250 genes of immunological interest. Fig. 1⇓ displays the differential induction of cytokine and chemokine mRNAs among the different treatments. IL-17, IL-2, and lymphotactin were all induced prominently by B. burgdorferi but not significantly by IL-12, as was heat shock protein-60. Although both IL-12 and B. burgdorferi induced IFN-γ mRNA, as expected, the effect of IL-12 was stronger, but more transient. Similarly, GM-CSF was induced more strongly, but transiently, by IL-12. TNF-α, MIP-1α, and MIP-1β, each of which has been associated with a Th1 phenotype, were similarly elevated by both IL-12 and B. burgdorferi. Finally, mRNA levels for the Th2 cytokines IL-4 and IL-10 were depressed in cells treated with IL-12 or B. burgdorferi in the primary stimulation, relative to cells exposed to OVA peptide alone. It was clear from these results that the Th1 phenotypes resulting from activation in the presence of B. burgdorferi or IL-12 were distinct. We further analyzed expression of IL-17 in Th lymphocytes. Differential expression of mRNAs in DO11.10 TCR-transgenic T cells primed under different conditions. DO11.10-transgenic SC were primed with OVA alone (□) or with OVA plus IL-12 (○), or OVA plus B. burgdorferi lysate (▵). Seven days later, each culture was restimulated for 2, 6, or 20 h with APC and OVA alone, and RNA from MACS-purified CD4+ T cells was isolated. At each time point, RNA was also isolated from control samples that were not restimulated with OVA. The RNAs were analyzed on DNA chips that monitor the expression of ∼250 genes of immunological interest. The mRNA frequency (number of particular mRNA molecules per 106 total mRNA molecules) under the different experimental conditions is given on the y-axis for the different time points indicated on the x-axis. Note the different scales of the individual y-axes. The experiment was repeated once with similar results. We next analyzed on the level of individual cells the expression of IL-17 induced by B. burgdorferi sonicates or OspA lipopeptide. Spleen cells from DO11.10 TCR-transgenic mice were primed in vitro with peptide under neutral conditions (no further additions), Th1-inducing (addition of IL-12 and anti-IL-4), Th2-inducing (addition of IL-4 and anti-IL-12) conditions, or in the presence of either B. burgdorferi N40 sonicates or OspA lipopeptide. Seven days later, aliquots of the different cell lines were restimulated in vitro with APC and OVA for ELISA, and other aliquots were restimulated with PMA/ionomycin for intracellular FACS-analysis of cytokine production. Fig. 2⇓A shows that T cells that had been primed with OVA in the presence of B. burgdorferi lysates produced ∼6 fold more IL-17 (5700 ± 700 pg/ml; mean ± SEM of three independent experiments) than the cells that had been primed with OVA alone (1000 ± 200 pg/ml). The amount of IL-17 produced by Th cells primed under Th1 conditions was similar to that of Th cells primed with OVA alone (1300 ± 400 pg/ml; Fig. 2⇓A), Th2 conditions resulted in a slightly reduced IL-17 production (400 ± 100 pg/ml), and the synthetic lipopeptide’s effect was somewhat weaker than that of B. burgdorferi lysate (3200 ± 700 pg/ml). Corresponding results were obtained by flow cytometric analyses of intracellular IL-17 production (Fig. 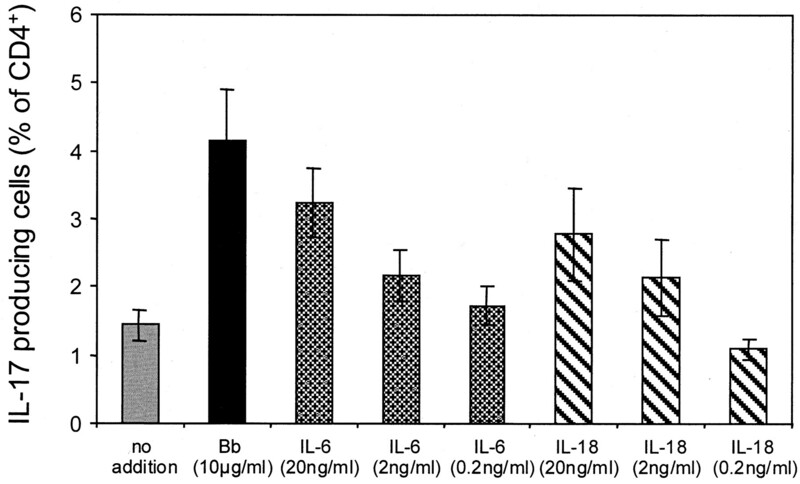 2⇓B): 1.6 ± 0.2% (mean ± SEM of six independent experiments) of the T cells primed with OVA alone expressed IL-17 upon restimulation with PMA/ionomycin. Priming in the presence of B. burgdorferi lysates resulted in an ∼3-fold increase of IL-17 producers: 4.7 ± 0.4% of these T cells expressed IL-17 (Fig. 2⇓B), and similar results were obtained with the synthetic lipopeptide derived from B. burgdorferi OspA (3.1 ± 0.1%). In contrast, priming with OVA under Th1-inducing conditions did not change the percentage of IL-17 producers (1.4 ± 0.3%) as compared with neutral conditions, and priming with OVA in the presence of Th2-inducing conditions led to a small but reproducible decrease in the percentage of IL-17 producers (0.7 ± 0.1%). Thus, the presence of B. burgdorferi or the synthetic lipopeptide derived from B. burgdorferi OspA during T cell priming induced enhanced IL-17 production. Furthermore, priming of transgenic Th cells in the presence of mycobacterial lysates (10 μg/ml) also resulted in a small but reproducible increase in the number of IL-17-producing Th cells (Fig. 2⇓C). The B. burgdorferi-induced IL-17 production depended on the presence of APC. 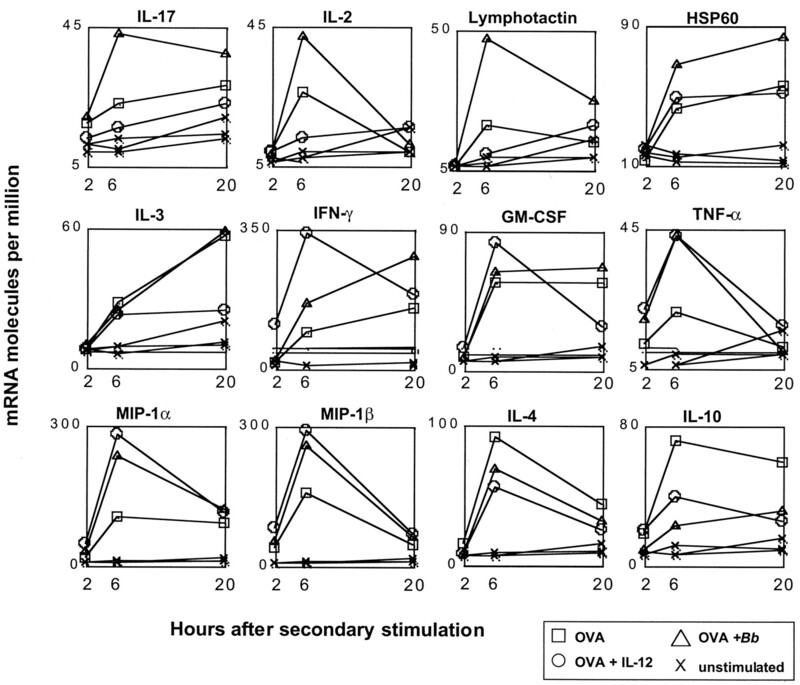 CD4+ T cells from DO11.10-transgenic mice were sorted by MACS to >98% purity, primed in vitro with anti-CD3/anti-CD28 in the presence or absence of B. burgdorferi N40 sonicates or lOspA, and restimulated 7 days later with PMA/ionomycin. When T cells were primed with antiCD3/antiCD28 in the absence of APC, B. burgdorferi did not induce increased IL-17 production (data not shown). 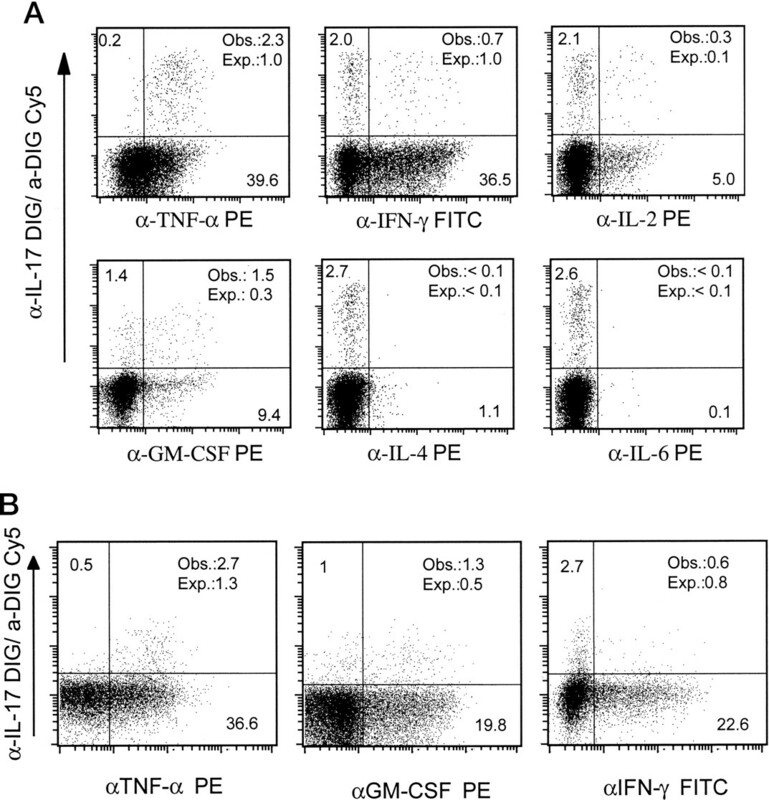 IL-17 production of DO11.10 TCR-transgenic T cells primed under different conditions. DO11.10 transgenic SC were primed OVA alone or with OVA plus IL-12 plus anti-IL-4 (Th1-inducing conditions), OVA plus IL-4 plus anti-IL-12 (Th2-inducing conditions), OVA + B. burgdorferi lysate (Bb), or OVA + LpA. A, Seven days after priming, the cells were restimulated with APC and OVA alone. Supernatants were taken 48 h later and assayed by ELISA for IL-17. Data shown are mean ± SEM of three independent experiments. B, Seven days after priming, the cells were restimulated with PMA/ionomycin and assayed flow cytometrically for intracellular IL-17. Data shown are mean ± SEM of six independent experiments. C, Spleen cells from DO11.10-transgenic mice were primed with peptide alone (OVA) or in the presence of B. burgdorferi lysate (Bb) or mycobacterial lysate (Myco). Seven days after priming, the cells were restimulated with PMA/ionomycin and assayed flow cytometrically for intracellular IL-17. The numbers given in the right upper quadrants indicate the percentage of IL-17 producing cells within the CD4+ population. Data are shown from one characteristic of three separate experiments. The data shown in Fig. 2⇑ demonstrate that murine T cells produce IL-17. The cellular source of murine IL-17 was hitherto not known exactly, and IL-17-production has thus far not been reported for murine CD4+ T cells. It was, therefore, important to determine which Th subset produced IL-17. Spleen cells from DO11.10 TCR-transgenic mice were primed in vitro with OVA in the presence of B. burgdorferi N40 sonicates, restimulated with PMA/ionomycin 7 days later, and analyzed for intracellular IL-17 staining as described above. The IL-17+ T cells were gated and analyzed for surface expression of CD4, CD8, and the DO11.10 TCR. As shown in Fig. 3⇓, all the IL-17-producing cells were CD4+-transgenic T cells. 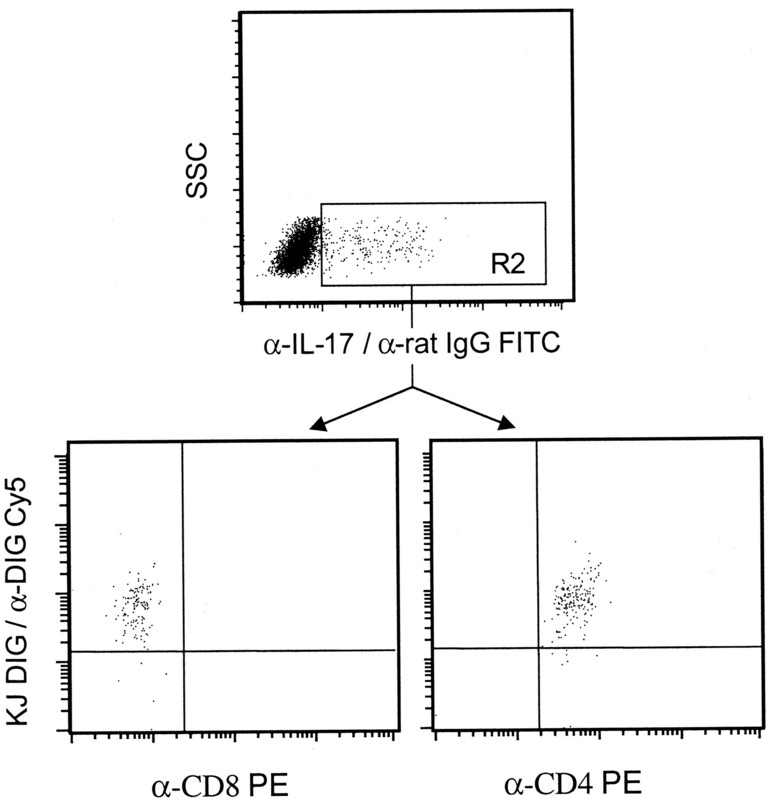 IL-17 is produced by CD4+ T cells. DO11.10-transgenic SC were primed with OVA in the presence B. burgdorferi lysate. Seven days later, the cells were stimulated with PMA/ionomycin. After incubation, cells were stained with anti-CD4-PE or anti-CD8-PE and anti-clontype-Dig followed by anti-Dig Cy5. Subsequently, cells were fixed and stained intracellularly with anti-IL-17 and anti-IgG-FITC. Data are representative of more than three separate experiments. Exposure to microbes such as B. burgdorferi or M. bovis BCG strain Danish induces the production of multiple cytokines in different host cells, including APC. Therefore, we tested the effects of several cytokines, known to be produced by APC upon exposure to B. burgdorferi or M. bovis BCG strain Danish, on Th cell IL-17 production. Splenocytes from DO11.10 TCR-transgenic mice were primed with OVA peptide in the presence or absence of additional cytokines as described above. Seven days later, the cells were restimulated with PMA/ionomycin, and intracellular IL-17 production was assessed by flow cytometry. IL-6 and IL-18 both increased IL-17 production in a dose-dependent manner albeit to a slightly lesser degree than B. burgdorferi lysate (Fig. 4⇓). IL-1β, IL-17, IFN-γ, and TNF-α had no effect on IL-17 production over a wide range of doses (data not shown). Effects of IL-6 and IL-18 on IL-17 production. DO11.10-transgenic SC were primed with OVA alone or in the presence of 10 μg/ml B. burgdorferi lysate (Bb), or IL-6 or IL-18 at the indicated concentrations. Seven days later, the cells were stimulated with PMA/ionomycin and then fixed. Cells were then stained intracellularly with anti-IL-17 and anti-IgG FITC. Data shown are mean ± SEM of three separate experiments. We next examined whether coexpression of IL-17 with other cytokines was coordinate or stochastic. DO11.10 TCR-transgenic cells were primed in the presence of B. burgdorferi N40 or M. bovis BCG strain Danish sonicates, restimulated, and stained as described above. The coexpression of IL-17 with other cytokines is shown in Fig. 5⇓. The observed frequencies of cytokine-coexpressing cells are compared with those calculated for expected values (i.e., random coincidence) to determine whether coexpression was coordinate or independent. IL-17 production was strongly associated with TNF-α production. Almost all IL-17-producing Th cells simultaneously produced TNF-α (Fig. 5⇓A). All of the cells that stained brightly for IL-17 coproduced TNF-α. The percentage of IL-17+ Th cells that simultaneously produced GM-CSF was much higher than expected for random coexpression (Fig. 5⇓). Coproduction of IL-17 with IL-2 was somewhat higher than random; still, only a minority of IL-17 producers coexpressed IL-2. In contrast, the coexpression of IL-17 with the prototypic type 1 cytokine IFN-γ was random (Fig. 5⇓). Furthermore, very few, if any IL-17 producers coexpressed IL-4. This does not necessarily indicate a negative correlation between IL-17 and IL-4 production: given that ∼2.7% of the cells in this culture produced IL-17 and only 0.8% produced IL-4, the expected value for random coexpression would only be 0.02%. However, we also did not find coexpression of IL-17 and IL-4 in Th2 cultures, in which a large fraction of the cells produced IL-4 (data not shown). Thus, IL-17 cannot be categorized as a Th1 or Th2 cytokine. Instead, it is coexpressed with TNF-α and GM-CSF. The coordinate expression of IL-17 with TNF-α and GM-CSF but not IFN-γ or IL-2 is not limited to B. burgdorferi-induced IL-17 production. We also found the same pattern in IL-17 producers that were induced by M. bovis BCG strain Danish lysates (Fig. 5⇓B). Coexpression of IL-17 with other cytokines. DO11.10-transgenic SC were primed with peptide (OVA) in the presence of 10 μg/ml B. burgdorferi lysate (A) or 10 μg/ml lysed M. bovis BCG strain Danish (B). Seven days later, the cells were stimulated with PMA/ionomycin and then fixed. Subsequently, two-color intracellular cytokine staining was performed, simultaneously using digoxigenized, FITC- or PE-conjugated anti-cytokine mAbs or isotype control mAbs. The frequency of cytokine producing cells is indicated in the quadrants in percent. In the upper right quadrants, the observed frequency (obs) of cytokine-coexpressing cells, and the expected frequency (exp) calculated for random coincidence of two independent variables are indicated. Data are representative of three separate experiments. Among the different factors that influence the differentiation of an uncommitted Th cell into either Th1 or Th2, cytokines present during T cell priming are probably most important. We asked whether IL-17 influenced Th phenotype development. Spleen cells from DO11.10 TCR-transgenic mice were cultured with peptide in the presence or absence of additional cytokines and restimulated 7 days later with PMA/ionomycin as described for Fig. 2⇑. When no exogenous cytokines or Abs were added to the cultures, ∼35% of the cells produced IFN-γ and 29% produced IL-4 upon restimulation with PMA/ionomycin (Fig. 6⇓). When IL-12 and anti-IL-4 were added to the initial cultures to induce Th1 phenotype development, 79% of the cells produced IFN-γ and 3% IL-4 (Fig. 6⇓). Following culture in the presence of IL-4 and anti-IL-12, 42% of the cells produced IL-4 and 28% produced IFN-γ. The addition of IL-17 at doses from 0.2 ng/ml up to 20 ng/ml to the cultures did not significantly alter either IFN-γ or IL-4-production as compared with neutral conditions (Fig. 6⇓). IL-17 does not induce Th1 or Th2 phenotype differentiation. DO11.10-transgenic SC were primed with OVA alone or OVA in the presence of IL-12 plus anti-IL-4 (Th1-inducing conditions), IL-4 plus anti-IL-12 (Th2-inducing conditions), or different concentrations of IL-17. Seven days later, the cells were stimulated with PMA/ionomycin and then fixed. Subsequently, two-color intracellular cytokine staining was performed with PE-conjugated anti-IFN-γ and digoxigenized anti-IL-4 followed by anti-DIG Cy5. The numbers given in the quadrants indicate the percentage of cytokine-producing cells. Data are representative of three separate experiments. We examined whether synovial fluid Th cells from patients with Lyme arthritis, which is caused by B. burgdorferi, produced IL-17. In preliminary experiments, we analyzed surface expression of CD3, CD4, and CD8 and intracellular staining for IL-17. 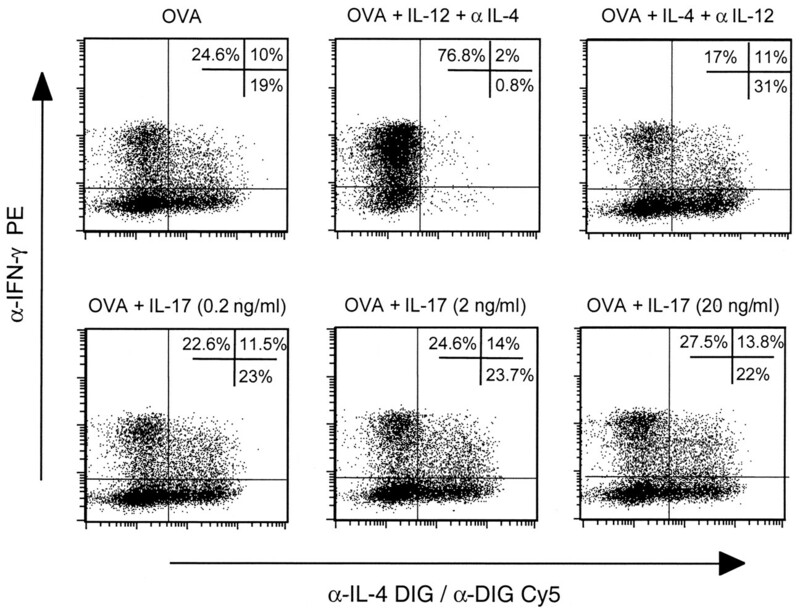 IL-17 was produced exclusively by CD3+CD8− cells (data not shown). Subsequently, we used CD3 surface staining in conjunction with intracellular cytokine staining. SFMC from seven patients with Lyme arthritis and one patient with reactive arthritis and PBMC from four healthy donors were stimulated with PMA/ionomycin and analyzed for intracellular IL-17 and TNF-α staining and for surface-expression of CD3. Very few, if any, Th cells obtained from the blood of healthy donors produced IL-17 (0.3 ± 0.01%, mean ± SEM) (Fig. 7⇓A). In contrast, 2.2 ± 0.3% of the Th cells from the synovial fluid of patients produced IL-17 (Fig. 7⇓A). Although the percentage of IL-17 producers within SFMC was relatively small, IL-17 production was again positively correlated with TNF-α production (Fig. 7⇓B). 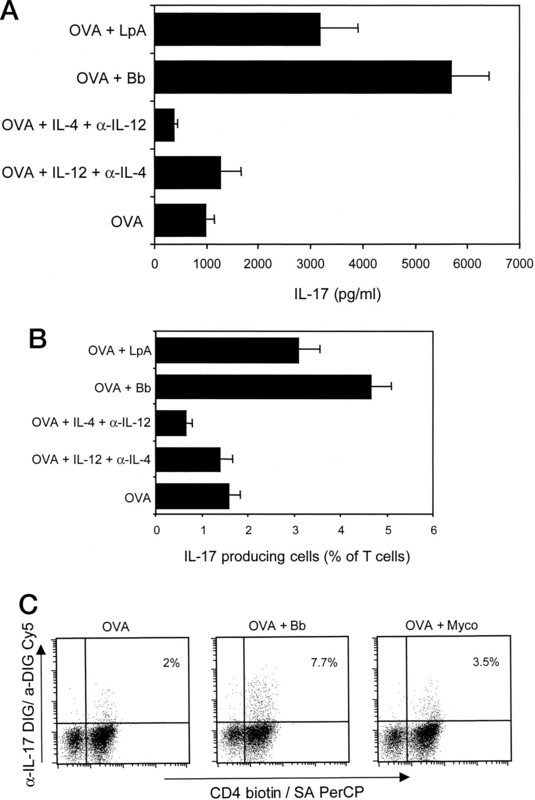 IL-17 production by synovial fluid Th cells. SFMC from seven patients with Lyme arthritis and one patient with reactive arthritis, and PBMC from four healthy controls were stimulated with PMA/ionomycin and assayed flow cytometrically for intracellular IL-17. A, Percentage of IL-17-producing Th cells in healthy donors and arthritis patients. B, Coexpression analysis of IL-17 with IFN-γ or TNF-α. The frequency of cytokine producing cells is indicated in the quadrants in percent. In the upper right quadrants, the observed frequency (obs) of cytokine-coexpressing cells, and the expected frequency (exp) calculated for random coincidence of two independent variables are indicated. Data are from one characteristic patient with Lyme arthritis. To date, the development, stability, and plasticity of Th subsets have been studied mostly in T cells that were cultured in vitro in the presence of cytokines and Abs (6, 8, 12, 13, 16, 17, 18, 19, 20). In addition, Th cells activated in vivo with highly differentiated patterns of cytokine secretion have been isolated from patients or in various models of chronic inflammatory diseases or in chronic infection (14, 15, 23). Little is known about the physiological pathways of Th differentiation and the stability or plasticity of Th cytokine production induced by microbes. Here, we used oligonucleotide arrays to compare the effects of B. burgdorferi on the cytokine production of Th cells with the well-documented effects of exogenously added IL-12 and anti-IL-4. This analysis revealed that a number of genes were exclusively or predominantly induced by B. burgdorferi but not by IL-12. One such gene was that for IL-17, which we decided to analyze in more detail. IL-17 originally had been described as a cytokine produced by activated murine cytotoxic T cells and called CTLA-8 (48). Murine IL-17 is a ∼21-kDa glycoprotein consisting of 147 amino acids that has 57% sequence identity with a herpesvirus Saimiri protein (HVS 13, also called vIL-17) (49). It shares 63% amino acid sequence homology with the 155-aa huIL-17 protein, but has no obvious homologies with other cytokines (37, 50). Similar to other mRNAs encoding proinflammatory cytokines, the human and murine IL-17 mRNAs possess several ATTTA motifs (37, 48) associated with rapid mRNA decay (51, 52). A receptor for IL-17 (IL-17R) with ubiquitous tissue distribution has been described. This IL-17R has no homology with any of the known cytokine receptor families. Furthermore, there are no obvious motifs in the receptor’s intracellular domain, which would suggest how signal transduction is mediated following ligation of the IL-17R (36, 50). Similar to TNF-α, with which it is coexpressed as described here, IL-17 activates the transcription factors NF-κB and AP-1 (36, 50, 53, 54), both of which are involved in the regulation of expression of proinflammatory cytokines. Accordingly, IL-17 exhibits pleiotrophic activities on various parenchymal cells, including the induction of IL-6, IL-8, G-CSF, leukemia inhibitory factor, PGE2, ICAM-1, and matrix metalloproteinase expression in fibroblasts and other stromal cells (36, 37, 50, 55, 56, 57), production of NO, iNOS, and cyclooxygenase-2 by chondrocytes (53, 58), induction of osteoclast differentiation factor in osteoblasts (39), stimulation of granulopoiesis (37, 59), maturation of dendritic cells (60), and costimulation of T cell proliferation (36). IL-17 mRNA had been detected in activated murine T cells (36) and human CD4 memory cells (37, 39, 50). Nothing is known about its regulation or the stimuli that naturally induce IL-17 production. Here, we show that IL-17 production by activated Th cells is enhanced ∼6-fold by microbial lipopeptides. Microbial lipopeptides did not enhance the IL-17 production of T cells primed with plate-bound Abs against CD3 and CD28 in the absence of APC. Therefore, the microbial lipopeptides act on APC rather than directly on T cells. Bacterial (lipo) proteins, such as OspA or the mycobacterial 19-kDa protein, activate APC after binding to Toll-like receptors (61, 62). Our findings that both spirochaetal lipopeptides and mycobacterial lysates induce IL-17 production in Th cells in an APC-dependent manner are compatible with the hypothesis that Toll-like receptor-mediated activation induces APC to produce a currently unidentified factor(s) that induces IL-17 production in Th cells. In support of this hypothesis, we found that exposure to IL-6 or IL-18, two cytokines which are produced by activated APC, also increased the IL-17 production of activated Th cells. The fact that exogenously added IL-6 enhanced IL-17 production of Th cells is of interest because one of the major in vivo effects of IL-17 is the induction of IL-6, e.g., in rheumatoid synovial cells (36, 37, 50, 55, 56). Furthermore, both TNF-α and IFN-γ have additive effects on the IL-17-induced expression of IL-6 (37). The IL-17 mRNA is equipped with eight ATTTA motifs (37, 48), which should normally prevent long-term effects of microbe-induced IL-17 (51, 52). Chronic infection, e.g., with B. burgdorferi or Chlamydia trachomatis (63), could maintain an IL-17-inducing stimulus. The reciprocal induction/enhancement of IL-17 and IL-6 could then contribute to the pathogenesis of chronic inflammatory diseases such as antibiotic-resistant Lyme arthritis (42, 63). Thus, IL-17-producing Th cells could become an important therapeutic target for the suppression of chronic inflammation. The role of infections in the other chronic inflammatory conditions in which IL-17 has been detected (38, 39, 40, 55, 64, 65) remains to be determined. There is ample evidence for IL-17 as a mediator of inflammation in humans. 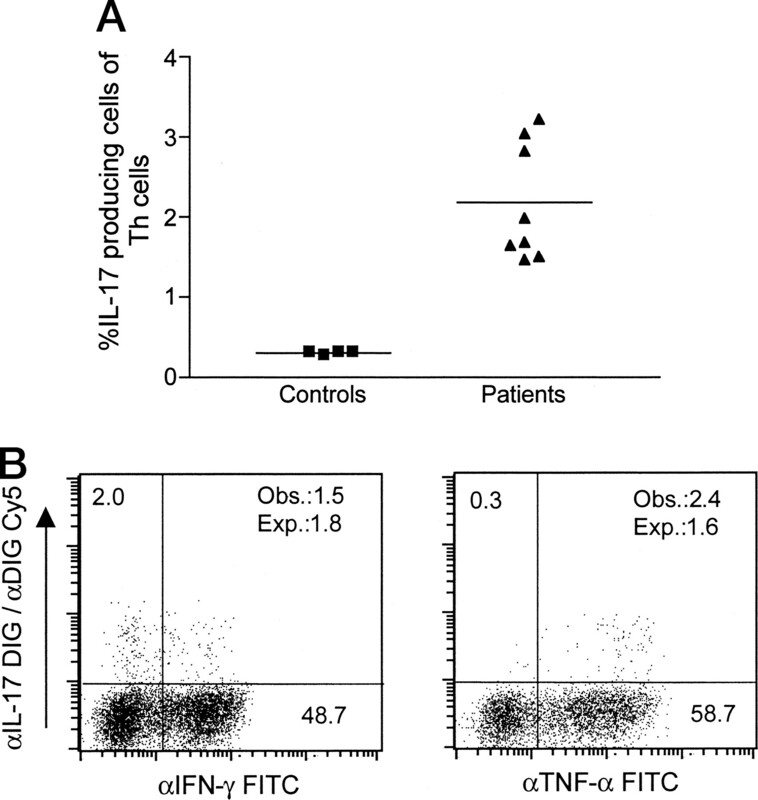 Several studies have detected IL-17-expressing human T cells in inflammatory lesions. Rheumatoid arthritis is the best-characterized example: IL-17 is expressed, secreted, and functional in rheumatoid synovia (38, 39, 55) but not in osteoarthritic synovia (38, 39). CD45RO+CD4+ T lymphocytes are the source of IL-17 in the synovia as determined by immunohistochemistry (38, 39). Within the inflamed rheumatoid synovium, IL-17 is a major stimulus for the secretion of IL-6 by synoviocytes. When pieces of synovium were cultured for 1 wk in the presence or absence of Abs against IL-17, the production of both IL-6 and leukemia inhibitory factor were reduced by up to 70% in the presence of anti-IL-17 (38, 55). Of note, these highly effective concentrations of IL-17 are detected in rheumatoid synovium, although only ∼1% of synovial T cells were found to express IL-17 mRNA by in situ hybridization (38). This is similar to the ∼2% synovial fluid Th cells, which we found to produce IL-17 upon polyclonal stimulation, and it is reasonable to assume that this relatively small population may exert significant physiological effects in vivo. Supporting this hypothesis, IL-17 mRNA-expressing cells were found in higher numbers during clinical exacerbations in patients with multiple sclerosis compared with remission, and IL-17 mRNA-expressing MNC were found more frequently in cerebrospinal fluid as compared with peripheral blood in these patients (40). Finally, IL-17 message has been detected in T cells from various inflammatory skin lesions (64, 65) and in rejected but not in functional kidney transplants (66, 67). We show here for the first time that microbial stimuli induce IL-17 production in murine CD4+ Th cells and that the percentage of IL-17 producing synovial fluid T cells from patients with Lyme arthritis or Chlamydia-induced reactive arthritis is significantly higher than in controls. IL-17 production is induced by B. burgdorferi both in mice and in patients and may be of importance for the chronic inflammatory conditions, e.g., antibiotic-resistant arthritis, sometimes induced by infection with B. burgdorferi. The highly coordinate expression of IL-17 with TNF-α, together with its presence and function in chronic inflammatory lesions, argue for an important role of IL-17 in infection-induced inflammatory responses. Our analyses of IL-17 coexpression with other cytokines revealed that it is neither a typical Th1 nor Th2 cytokine. Accordingly, the in vitro conditions that induce either Th1 or Th2 development had no effect on the frequencies of IL-17-producing Th cells or the amount of IL-17 secreted into the culture supernatants. Vice versa, exogenously added IL-17 did neither affect Th1/Th2 phenotype differentiation nor did it induce IL-17 production. Thus, IL-17 cannot be classified as typical Th1 or Th2 cytokine. Similarly, when the cytokine production of human T cell clones obtained from rheumatoid synovium (68) or from inflammatory skin lesions (64, 65) had been examined, no correlation between IL-17 production and the production of either IL-4 or IFN-γ (68) had been detected such that human IL-17 had previously not been classified as Th1 or Th2 cytokine. Instead, we here describe that almost all IL-17-producing Th cells, murine and human, also produce TNF-α, a potent proinflammatory cytokine that is an effective therapeutic target in chronic inflammatory diseases, such as rheumatoid arthritis (69) and chronic inflammatory bowel disease (70). In both murine and human Th cells, IL-17 production was also positively correlated with that of another proinflammatory cytokine, GM-CSF. In summary, we have shown that microbial lipopeptides induce the production of IL-17 together with TNF-α and GM-CSF. We demonstrated T cells coexpressing IL-17 and TNF-α in the synovial fluid of patients with Lyme arthritis and suggest microbe-induced IL-17 expression as a possible mediator of infection-induced immunopathology. We thank Dr. A. Kramer (Institut für Medizinische Immunologie, Charité, Berlin, Germany) for OVA, Dr. U. E. Schaible (Max-Planck-Institut für Infektionsbiologie) for mycobacterial lysates and helpful discussions, Drs. A. Krause (Charité University Hospital) and J. Sieper (Klinikum Benjamin Franklin) for patient samples, Dr. P. Marrack for the KJ1.26 hybridoma, Dr. H. Hecker, T. Geske, and M. Steinbach for excellent technical assistance, M. Ohde for excellent animal care, and Drs. K. Bonhagen and A. Radbruch for helpful discussions. ↵1 This work was supported by the Berliner Senatsverwaltung für Wissenschaft und Kultur, and grants from the Sandoz-Stiftung für therapeutische Forschung and the Forschungskommission of the Charité University Hospital (to T.K.). ↵3 Abbreviations used in this paper: LpA, lipopeptide A; Dig, digoxigenin; SFMC, synovial fluid mononuclear cells; BCG, bacillus Calmette-Guérin; MACS, magnetic cell separation. Byrne, M. C., M. Z. Whitley, and M. T. Follettie. 2000. Preparation of mRNA for expression monitoring. In Current Protocols of Molecular Biology, F. M. Ausubel, R. Brent, R. E. Kingston, D. D. Moore, J. G. Seidman, J. A. Smith, and K. Struhl, eds. John Wiley & Sons, New York, p. 22.2.1–22.2.13.